Wedding PR: The Perfect Palette, The Knot, and Catersource! Wedding PR: The Perfect Palette, The Knot, Catersource, and more! We are so excited to kick off this week with some fabulous client features including The Perfect Palette, The Knot, Catersource and so much more! See below to check it all out. 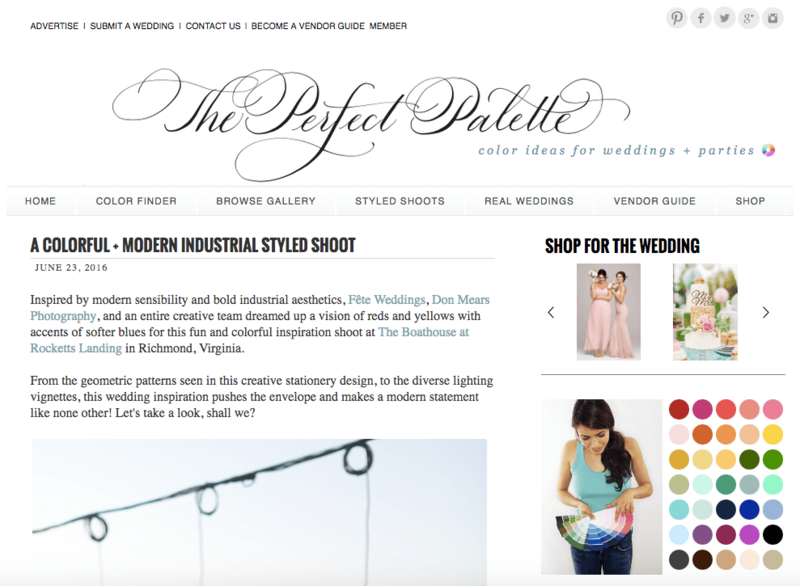 Don Mears Photography was featured on The Perfect Palette with an industrial wedding. Check out the full feature here. 100 Candles was featured on Catersource with their guest article Questions to ask your venue about lighting. See the full article here. Fantasy Sound and Historic Mankin Mansion were featured on SheFinds in the roundup 8 Things Brides Forget to do Between The Wedding Rehearsal and the Wedding Ceremony. See the full feature here. Fantasy Sound was featured on Wedding IQ with their article Why Wedding Vendors Need to Work Together Like a Well-Oiled Machine – And Exactly How to Do It. See the full feature here. Get Polished was featured on The Knot as expert commentary in their article on wedding planning arguments. See the full article here. Mike B Photography, Kaysha Weiner Photographer, Magdalene Photography, and Be Photography were featured in the Huffington Post article The Key to a Killer Engagement Shoot. See the full feature here. Historic Mankin Mansion and Where Will They Stay? were featured on SheFinds in the roundup 7 Things Couples Forget to do After They Set a Wedding Date. See the full feature here. Taylor’d Events was featured on WeddingWire Pro with their guest article Risk Management: Identifying Significant Risks. See the full article here. Fantasy Sound was featured on Catersource in a guest blog about chandeliers. See the full blog here. Stephanie Yonce Photography was featured on Elizabeth Anne Designs with a Washington DC Country Club wedding. See the full feature here.